The Caines’ Brothers and Five Star Barbershop provided an overview of their upcoming Back to School Extravaganza to be held on Thursday [Sept 6] with students being offered haircuts, hair braiding, free year membership to the Bermuda Aquarium Museum and Zoo, free dental screenings, a free library card and more. A spokesperson said, “This year we will host the Caines’ Brothers and Five Star Barbershop Back to School Extravaganza at the New Testament Church of God Heritage Worship Center on Dundonald Street on Thursday, September 6, 2018, with doors opening at 8:00 am. “Our theme for this year is ‘Success Never Sleeps.’ The message that we are trying to convey to the students is that in order to the be best you can be, you must be focused, dedicated and committed to your future and that starts now! “We recognize that students will visit us for haircuts and hair braiding but this event is designed to create a fun and empowering atmosphere that will inject our youth with hope and to allow them to see and feel the community love and support. “This year we have some new and exciting partnerships. The Bermuda Zoological Society will be giving each student free year membership to the Bermuda Aquarium Museum and Zoo. Coral Dental will be providing free dental screenings, however, students must have parental consent. “The Bermuda Youth Library will be signing up each student for a free library card. Pristine Group will be giving out 20 free passes to the Young, Original, and Unstoppable Girls’ Conference. “We would like to acknowledge and thank our title sponsors, Sun Life Financial International and Hiscox. We would also like to acknowledge our other sponsors Marsh and McLennan, Sunshine Company and Titan Express. 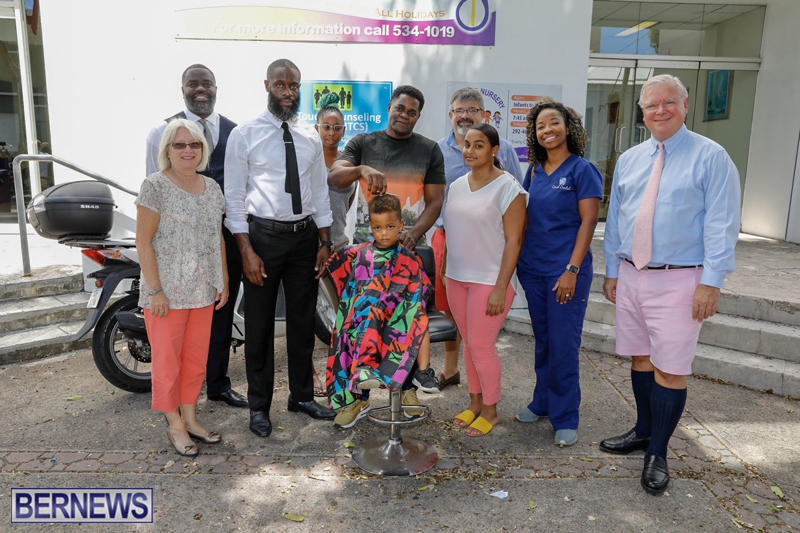 “We must thank in advance the volunteer barbers and hair braiders who work tirelessly to ensure that our students look their best on the first day of school. This event would be unable to take place without all of the other volunteers who give their time to this support this event and the individual donors who gave their financial support. “As usual, students will receive complimentary backpacks, lunch bags, gym bags, and school supplies. Complimentary food and drinks will be provided along with motivating speeches and other fun-filled events. “All boys haircuts will be basic haircuts with no designs and all girls’ hair must be washed and detangled when they come to the event.